Greek Orthodox Community of Melbourne and Victoria - A year of unprecedented success for our Greek Language Schools. A new school year has commenced and the interest in our Afternoon and Saturday Greek language schools is exceptionally high, with an increasing number of parents enrolling their children. The successfully 2010 VCE results, in combination with a proficient educational program, have been a major factor in such unparalleled demand for enrolments. Enrolments for the 2011 school year are already underway and are expected to surpass the number of last year’s enrolments. The Board of Management of the GOCMV recently honoured those students who excelled in VCE for the subject of Greek as well as the teachers for their exceptional efforts during the school year at the annual Christmas party. The event was held on Tuesday, 21 December 2010, and was attended by a large number of students, parents, teachers and Community members. The GOCMV in conjunction with the Education Office of the Greek Consulate in Melbourne and the Bank of Cyprus Australia presented awards to students who excelled in the subject of Modern Greek. The Greek Community also acknowledged students that have excelled in the Greek language who attended State schools and presented an award to Stephanie Margelis from the Βalwyn High School. 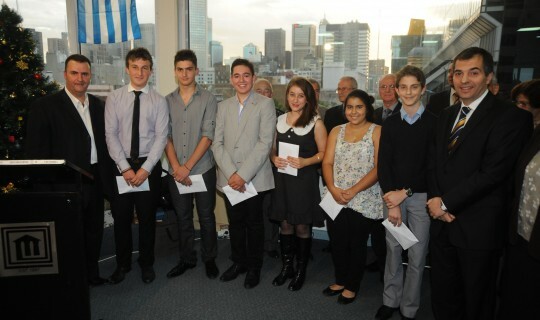 During the course of the evening the Greek Consul for Educational Affairs in Melbourne, Dr Charalambos Ladopoulos, presented awards to a number of students who excelled in the Greek language courses and in particular to the first three students who excelled in the VCE Greek language exams. He also presented an award to Mark Benevetsuro, from The Xavier College, who excelled in the subject of Ancient Greek. The representatives of the Bank of Cyprus Australia Mr Vassilis Anevlavis and Mr Paul Orfanos presented various awards to the best students of each GOCMV language school. Finally, the Board of Management of the Greek Orthodox Community honoured Mr. George Mpouzmpas, for his service its schools over the last three decades.